The Ardmore Gallery and Tearoom, Main Street, Ardmore, Co. Waterford reopened in the Summer of 2009 under Breda O'Brien; Breda, who is a well-known local artist has added her personal touch and come up with a winning formula through the combination of this artistic setting with a delightful tearoom, art workshop and art & craft gallery, making the Ardmore Gallery and Tearoom a true haven for the spirit. The tearoom, with adjoining garden, has proved to be an extremely popular addition to the gallery, serving tea, coffee, minerals and fresh cakes daily. And what better place to enjoy these delights than in the environs of a warm and light-filled gallery. 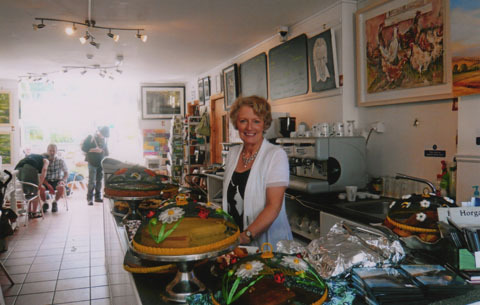 Breda O'Brien, the Proprietor of The Ardmore Gallery & Tearoom, exhibits regularly in the Munster Area and a variety of her Art work is on displayed in the Gallery. She produces commissioned pieces and is inspired and entranced by the colour, shape and form of rocks found on the beaches in her locality. Breda's work is a celebration of the Southeast Coastline and all who live therein. Inspiration also comes from the rich purple, pink and verdant green hues of The Vee and the Comeragh Mountains. She has developed her own individual style and technique that truly captures the vibrancy and transparency of colour. She works with oils, acrylics and glazes on canvas and board. 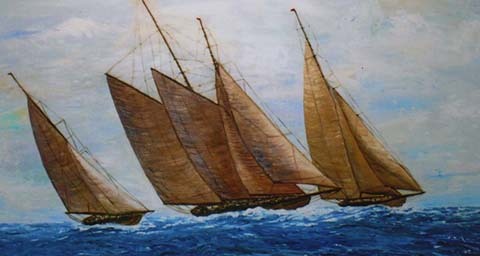 Breda's work has been purchased by the College of Law and Business in University College Cork (UCC). Her work is also in private collections in Ireland, Europe and America. In more recent years Breda has been studying Art & Design which enhance her art and craft in years to come. She also enjoys Ceramic and Batik craft.